Protein Blend (Whey Protein Hydrolysate, Whey Protein Isolate, Whey Protein Concentrate), Greek Yogurt Style Coating (Maltitol, Fractionated Palm Kernel Oil, Whey Protein Concentrate, Greek Yogurt Style Powder, Nonfat Dry Milk, Soy Lecithin, Lactic Acid, Natural Flavor), Hydrolyzed Collagen, Glycerin, Soy Crisps (Soy Protein Isolate, Tapioca Starch, Salt), Blueberry Pieces (Sugar, Corn Starch, Dried Blueberries, Fructose, Canola Oil, Dextrose, Corn Syrup Solids, Natural Color [fruit juice concentrates], Natural Flavor, Cellulose Gum), Maltitol Syrup, Water, Maltodextrin, Soy Protein Isolate, Natural Flavors, Canola Oil, Citric Acid, Vitamin and Mineral Blend (Calcium Carbonate, Ascorbic Acid, D-Alpha Tocopheryl Acetate, Niacinamide, Biotin, Zinc Oxide, Copper Gluconate, D-Calcium Pantothenate, Potassium Iodide, Vitamin A Palmitate, Tricalcium Phosphate, Pyridoxine Hydrochloride, Thiamin Mononitrate, Riboflavin, Folic Acid, Cyanocobalamin), Sucralose, Soy Lecithin, Peanut Flour, Almond Butter. WARNING: This product contains sugar alcohols, which may cause gastrointestinal discomfort. Excessive consumption may have a laxative effect. Protein Blend (Whey Protein Concentrate, Whey Protein Isolate, Milk Protein Isolate), Chocolate Flavored Coating (Maltitol, Fractionated Palm Kernel Oil, Whey Protein Concentrate, Cocoa [processed with alkali], Calcium Carbonate, Natural Flavors, Soy Lecithin, Sucralose), Hydrolyzed Collagen, Glycerin, Soy Crisps (Soy Protein Isolate, Tapioca Starch, Soy Lecithin, Salt), Milk Chocolate Drops (Sugar, Whole Milk Powder, Chocolate Liquor, Cocoa Butter, Milk Fat, Soy Lecithin, Natural Vanilla Flavor), Maltitol Syrup, Water, Maltodextrin, Soy Protein Isolate, Canola Oil, Natural Flavors, Calcium Carbonate, Vitamin And Mineral Blend (Ascorbic Acid, D-Alpha Tocopherol Acetate, Niacinamide, Zinc Oxide, Biotin, Copper Gluconate, D-Calcium Pantothenate, Potassium Iodide, Vitamin A Palmitate, Tricalcium Phosphate, Pyridoxine Hydrochloride, Thiamin Mononitrate, Riboflavin, Folic Acid, Cyanocobalamin), Cocoa Powder, Sucralose, Xanthan Gum, Peanut Flour, Soy Lecithin, Almond Butter. Protein Blend (Milk Protein Isolate, Whey Protein Isolate, Whey Protein Concentrate), Chocolate Flavored Coating (Maltitol, Fractionated Palm Kernel Oil, Whey Protein Concentrate, Cocoa Powder [Processed With Alkali], Calcium Carbonate, Natural Flavors, Soy Lecithin, Sucralose), Hydrolyzed Collagen, Glycerin, Cocoa Powder, Water, Milk Chocolate Drops (Sugar, Whole Milk Powder, Chocolate Liquor, Cocoa Butter, Milk Fat, Soy Lecithin, Natural Vanilla Flavor), Maltitol Syrup, Peanut Flour, Calcium Carbonate, Natural Flavors, Vitamin And Mineral Blend (Ascorbic Acid, d-Alpha Tocopherol Acetate, Niacinamide, Zinc Oxide, Biotin, Copper Gluconate, d-Calcium Pantothenate, Potassium Iodide, Vitamin A Palmitate, Tricalcium Phosphate, Pyridoxine Hydrochloride, Thiamin Mononitrate, Riboflavin, Folic Acid, Cyanocobalamin), Sucralose, Almond Butter, Soy Lecithin. Chocolate Coating (Maltitol, Fractionated Palm Kernel Oil, Whey Protein Concentrate, Cocoa (Processed With Alkali), Calcium Carbonate, Natural Flavors, Soy Lecithin, Sucralose), Hydrolyzed Collagen, Peanut Flour, Protein Blend (Milk Protein Isolate, Whey Protein Concentrate, Whey Protein Isolate), Glycerin, Maltitol Syrup, Soy Crisps (Soy Protein Isolate, Tapioca Starch, Soy Lecithin, Salt), Water, Peanuts, Peanut Oil, Sucrose, Salt, Natural Flavor, Calcium Carbonate, Vitamin And Mineral Blend (Ascorbic Acid, D-Alpha Tocopherol Acetate, Niacinamide, Zinc Oxide, Biotin, Copper Gluconate, D-Calcium Pantothenate, Potassium Iodide, Vitamin A Palmitate, Tricalcium Phosphate, Pyridoxine Hydrochloride, Thiamin Mononitrate, Riboflavin, Folic Acid, Cyanocobalamin), Sucralose, Almond Butter, Soy Lecithin. Protein blend (milk protein isolate, whey protein concentrate, whey protein isolate), chocolate flavored coating, (maltitol, fractionated palm kernel oil, whey protein concentrate, cocoa (processed with alkali), calcium carbonate, natural flavors, soy lecithin, sucralose), caramel filling (maltitol syrup, nonfat milk, fractionated palm kernel oil, heavy cream [cream, milk, cellulose gel, milk solids, cellulose gum], milk protein concentrate, glycerin, butter, salt, natural flavor, disodium phosphate, carrageenan, soy lecithin, caramel), hydrolyzed collagen, glycerin, water, peanuts, natural flavors, soy crisps (soy protein isolate, tapioca starch, soy lecithin, salt), vitamin and mineral blend (ascorbic acid, d - alpha tocopheryl acetate, niacinamide, zinc oxcide, biotin, copper gluconate, d - calcium pantothenate, potassium iodide, vitamin A palmitate, tricalcium phosphate, pyridoxine hydrochloride, thiamin mononitrate, riboflavin, folic acid, cyanocobalamin), sucralose, natural almond butter. Adults, for best results, drink 8 fl. ounces of water or other liquid with this bar. Coating (Maltitol, Fractionated Palm Kernel Oil, Whey Protein Concentrate, Cocoa [Processed with Alkali], Sugar, Natural Flavors, Calcium Carbonate, Salt, Soy Lecithin, Peanut Flour, Sucralose, Nonfat Dry Milk Solids, Yogurt Powder [Cultured Whey Protein Concentrate, Cultured Skim Milk], Peanut Butter [Peanuts]), Caramel Layer (Maltitol Syrup, Nonfat Dry Milk, Heavy Cream [Cream, Milk, Cellulose Gel, Milk Solids, Cellulose Gum], Water, Milk Protein Concentrate, Palm Kernel Oil, Butter, Disodium Phosphate, Caramel, Natural Flavor, Soy Lecithin, Carrageenan), Hydrolyzed Collagen, Protein Blend (Milk Protein Isolate, Whey Protein Isolate), Glycerin, Soy Crisps (Soy Protein Isolate, Tapioca Starch, Soy Lecithin, Salt), Natural Flavors, Caramel Flavored Chips (Sugar, Palm Kernel Oil/Palm Oil, Nonfat Dry Milk, Whole Milk Powder, Cocoa Powder, Soy Lecithin, Natural Flavors, Annatto Extract Color, Natural Vanilla Extract), Maltitol Syrup, Water, Canola Oil, Salt, Vitamin and Mineral Blend (Ascorbic Acid, d-Alpha Tocopheryl, Niacinamide, Calcium Carbonate, Zinc Oxide, Biotin, Copper Gluconate, d-Calcium Pantothenate, Potassium Iodide, Vitamin A Palmitate, Tricalcium Phosphate, Pyridoxine Hydrochloride, Thiamin Mononitrate, Riboflavin, Folic Acid, Cyanocobalamin), Sucralose, Soy Lecithin, Natural Almond Butter, Peanut Flour. Contains milk, soy, peanut and tree nut (almond, coconut) ingredients. Protein Blend (Soy Protein Isolate, Whey Protein Isolate, Milk Protein Isolate), Maltitol Syrup, Dark Chocolate and Coconut Flavored Coating (Palm Kernel Oil, Maltitol, Milk Protein Isolate, Cocoa [Processed With Alkali], Dextrose, Soy Lecithin, Natural Flavor), Hydrolyzed Collagen, Glycerin, Cocoa Powder (Processed With Alkali), Natural Flavors, Coconut Flavored Chips (Maltitol, Rice Flour, Corn Starch, Canola Oil, Glycerin, Salt, Natural Flavor), Dehydrated Coconut, Tapioca Starch, Yogurt Flavored Coating (Sugar, Palm Kernel Oil, Nonfat Dry Milk Solids, Yogurt Powder [Cultured Whey Protein Concentrate, Cultured Skim Milk], Soy Lecithin, Salt, Natural Flavor), Water, Vitamin and Mineral Blend (Calcium Carbonate, Ascorbic Acid, D-Alpha Tocopherol Acetate, Niacinamide, Zinc Oxide, Biotin, Copper Gluconate, d-Calcium Pantothenate, Potassium Iodide, Vitamin A Palmitate, Tricalcium Phosphate, Pyridoxine Hydrochloride, Thiamin Mononitrate, Riboflavin, Folic Acid, Cyanocobalamin), Sucralose, Soy Lecithin, Almond Butter, Peanut Flour. Marshmallow Cream Layer (Maltitol Syrup, Milk Protein Concentrate, Palm Kernel Oil, Sorbitol, Nonfat Dry Milk, Soy Lecithin, Salt, Natural Flavors, Calcium Carbonate), Chocolate Flavored Coating (Maltitol, Fractionated Palm Kernel Oil, Whey Protein Concentrate, Cocoa (Processed With Alkali), Calcium Carbonate, Natural Flavors, Soy Lecithin, Sucralose), Hydrolyzed Collagen, Protein Blend (Whey Protein Isolate, Milk Protein Isolate, Whey Protein Concentrate), Glycerin, Soy Crisps (Soy Protein Isolate, Tapioca Starch, Soy Lecithin, Salt), Natural Flavors, Maltitol Syrup, Marshmallow Pieces (Sugar, Corn Starch, Fructose, Soy Bean Oil, Corn Syrup Solids, Natural Flavors, Salt, Soy Lecithin), Water, Milk Chocolate Drops (Sugar, Whole Milk Powder, Chocolate Liquor, Cocoa Butter, Milk Fat, Soy Lecithin, Natural Vanilla Flavor), Soy Protein Isolate, Canola Oil, Calcium Carbonate, Vitamin And Mineral Blend (Ascorbic Acid, D-Alpha Tocopherol Acetate, Niacinamide, Zinc Oxide, Biotin, Copper Gluconate, D-Calcium Pantothenate, Potassium Iodide, Vitamin A Palmitate, Tricalcium Phosphate, Pyridoxine Hydrochloride, Thiamin Mononitrate, Riboflavin, Folic Acid, Cyanocobalamin), Sucralose, Peanut Flour, Salt, Almond Butter, Soy Lecithin. Protein blend (whey protein hydrolysate, whey protein isolate, whey protein concentrate), Greek yogurt style coating (maltitol, fractionated palm kernel oil, whey protein concentrate, greek yogurt style powder, nonfat dry milk, soy lecithin, lactic acid, natural flavor), Hydrolyzed collagen, Glycerin, Soy crisps (soy protein isolate, tapioca starch, salt), Blueberry pieces (sugar, corn starch, dried blueberries, fructose, canola oil, dextrose, corn syrup solids, natural color, natural flavor, cellulose gum), Maltitol syrup, Water, Maltodextrin, Soy protein isolate, Canola oil, Natural flavors, Citric acid, Vitamin and mineral blend, Sucralose, Soy lecithin, Peanut flour, Almond butter. Protein Blend (Whey Protein Hydrolysate, Whey Protein Isolate), Coating (Maltitol Powder, Palm Kernel Oil, Nonfat Milk Solids, Cocoa Powder, Soy Lecithin, Salt, Natural Flavor), Hydrolyzed Collagen, Glycerin, Soy Crisps (Soy Protein Isolate, Tapioca Starch, Salt), Milk Chocolate Drops (Sugar, Whole Milk Powder, Chocolate Liquor, Cocoa Butter, Milk Fat, Soy Lecithin, Natural Vanilla Flavor), Maltitol Syrup, Water, Canola Oil, Maltodextrin, Natural Flavor, Calcium Carbonate, Vitamin And Mineral Blend (Ascorbic Acid, Tricalcium Phosphate, D-Alpha Tocopheryl Acetate, Niacinamide, Zinc Oxide, Copper Gluconate, D-Calcium Pantothenate, Vitamin A Palmitate, Pyridoxine Hydrochloride, Thiamin Mononitrate, Riboflavin, Folic Acid, Biotin, Potassium Iodide, Cyanocobalamin), Xanthan Gum, Peanut Flour, Sucralose, Soy Lecithin, Milk Protein Isolate, Wheat Germ, Almond Meal. Partialy Produced with Genetic Engineering. Protein blend (milk protein isolate, whey protein isolate, whey protein concentrate), chocolate flavored coating (maltitol, fractionated palm kernel oil, whey protein concentrate, cocoa [processed with alkali], calcium carbonate, natural flavors, soy lecithin, sucralose), hydrolyzed collagen, glycerin, cocoa powder, water, milk chocolate drops (sugar, whole milk powder, chocolate liquor, cocoa butter, milk fat, soy lecithin, natural vanilla flavor), maltitol syrup, peanut flour, natural flavors, sucralose, almond butter, soy lecithin. Adults, for best results drink 8 fl ounces of water or other liquid with this bar. Protein Blend (Whey Protein Hydrolysate, Whey Protein Isolate), Coating (Maltitol, Fractionated Palm Kernel Oil, Whey Protein Concentrate, Cocoa Powder (Processed with Alkali), Calcium Carbonate, Soy Lecithin, Natural Flavors, Sucralose), Hydrolyzed Collagen, Glycerin, Cocoa Powder, Water, Milk Protein Isolate, Milk Chocolate Drops (Sugar, Whole Milk Powder, Chocolate Liquor, Cocoa Butter, Milk Fat, Soy Lecithin, Natural Vanilla Flavor), Maltitol Syrup, Peanut Flour, Calcium Carbonate, Natural Flavor, Vitamin and Mineral Blend (Ascorbic Acid, d-Alpha Tocopheryl Acetate, Niacinamide, Tricalcium Phosphate, Zinc Oxide, Copper Gluconate, d-Calcium Pantothenate, Vitamin A Palmitate, Pyridoxine Hydrochloride, Thiamin Mononitrate, Riboflavin, Folic Acid, Biotin, Potassium Iodide, Cyanocobalamin), Sucralose, Almond Butter, Wheat Germ, Soy Lecithin. Chocolate Coating (Maltitol, Fractionated Palm Kernel Oil, Whey Protein Concentrate, Cocoa (Processed With Alkali), Calcium Carbonate, Natural Flavors, Soy Lecithin, Sucralose), Hydrolyzed Collagen, Peanut Flour, Protein Blend (Whey Protein Hydrolysate, Whey Protein Isolate), Glycerin, Maltitol Syrup, Soy Crisps (Soy Protein Isolate, Tapioca Starch, Salt), Water, Peanuts, Peanut Oil, Sucrose, Salt, Natural Flavor, Calcium Carbonate, Vitamin And Mineral Blend (Ascorbic Acid, D-Alpha Tocopheryl Acetate, Niacinamide, Tricalcium Phosphate, Zinc Oxide, Copper Gluconate, D-Calcium Pantothenate, Vitamin A Palmitate, Pyridoxine Hydrochloride, Thiamin Mononitrate, Riboflavin, Folic Acid, Biotin, Potassium Iodide, Cyanocobalamin), Sucralose, Soy Lecithin, Milk Protein Isolate, Wheat Germ, Almond Butter. Protein blend (whey protein hydrolysate, whey protein isolate, whey protein concentrate), Greek yogurt style coating (maltitol, fractionated palm kernel oil, whey protein concentrate, greek yogurt style powder, nonfat dry milk, soy lecithin, lactic acid, natural flavor), Hydrolyzed collagen, Glycerin, Soy crisps (soy protein isolate, tapioca starch, salt), Strawberry pieces (sugar, corn starch, dried strawberries, fructose, canola oil, dextrose, corn syrup solids, natural color, natural flavor, cellulose gum), Maltitol syrup, Water, Maltodextrin, Soy protein isolate, Canola oil, Natural flavors, Citric acid, Vitamin and mineral blend, Sucralose, Soy lecithin, Peanut flour, Almond butter. Pure Protein bars are the right choice for your on-the-go lifestyle. 28-32 Grams of Protein in Every Bar! 4 Grams of Sugar or Less! Available in 7 Delicious Flavors! 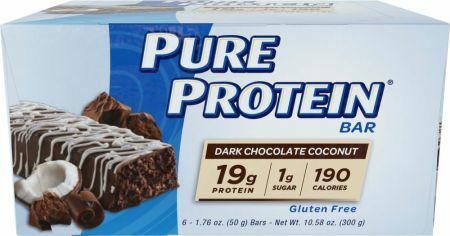 Pure Protein is on a mission to create bars that not only provide quality protein - but that actually taste great. The lineage began with the brand's flagship product – the Pure Protein 78g bar in the delicious Chocolate Peanut Butter flavor, with 31 grams of protein per serving. It includes the right combination of high protein and great taste.